I have something better than the bacon roundup today! One of the best things about being a bacon blogger is when your readers send you products to review. Oh okay, so it was my sister, but I swear she reads my blog! So I get the mail this week and what to my wondering eyes should appear but TWO bars of BACON CHOCOLATE! Not only that, but it's gourmet bacon chocolate! It's made by Vosges, a gourmet chocolate company, and it comes in two types: a deep (41% cacao) milk chocolate and a dark (62% cacao) chocolate. Called Mo's Bacon Bar, both of these large 3 oz. 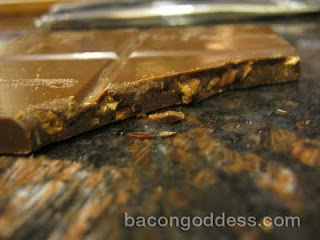 chocolate bars feature bacon! Of course I had to rip them open and start nomming. The description of the product tells you that it is applewood smoked bacon + Alder wood smoked salt + chocolate. The chocolate bars are divided into 8 squares (serving size: 4 squares) with the logo and a delightful little picture of a girl with a shopping bag imprinted on them. They both smell like chocolate, no bacon smell that I could pick up. I broke the bars and saw the bacon! It wasn't very big chunks, but definitely noticeable. The hardest part was deciding which to try first. I settled on the deep milk chocolate because dark chocolate is my favorite and I wanted to save that for last. Okay, so the deep milk chocolate is delicious. This is some beautiful creamy smooth chocolate right here. The bacon is interesting and adds a little smoky crunch and salt with just a hint of pork, but overall I'm more impressed with how delicious this chocolate is itself. 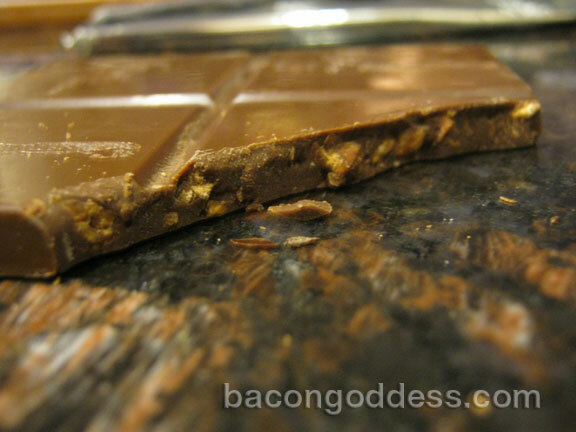 The dark chocolate, on the other hand, is the PEFECT medium for highlighting the bacon. The semi-sweet of the 62% cacao mingled with the salty smoky bacon crunch is simply divine. I might be a bit biased, though, because I sure do love me some dark chocolate! I'd definitely say that Vosges came up with the perfect ratio of bacon/chocolate for these. 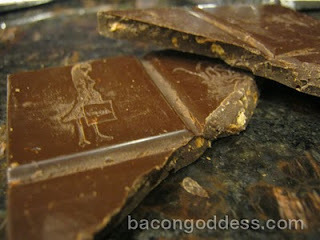 It's definitely bacon chocolate, but not so bacon-y that you lose the beautifully crafted chocolate. "I began experimenting with bacon + chocolate at the tender age of 6, while eating chocolate chip pancakes drenched in Aunt Jemima® syrup, as children often do. Beside my chocolate-laden cakes laid three strips of sizzlin' bacon, just barely touching a sweet pool of maple syrup. And then, the magic—just a bite of the bacon was too salty and I yearned for the sweet kiss of chocolate and syrup, so I combined the two. In retrospect, perhaps this was a turning point; for on that plate something magical happened, the beginnings of a combination so ethereal and delicious that it would haunt my thoughts until I found the medium to express it—chocolate." 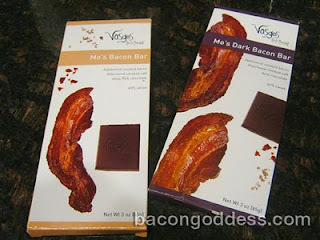 You can buy these online at vosgeschocolate.com along with some other really really cool looking bacon & chocolate products! Redefining bacon and eggs. Five dark chocolate half eggs arrive nestled in straw and are each filled with soft buttery bacon caramel. Bite, crack, ooze, salty-sweet delight. Five 1 ounce bacon caramel filled half eggs, presented in a purple gift box. It's a chocolate egg with chickens on it!